Fact or fiction? 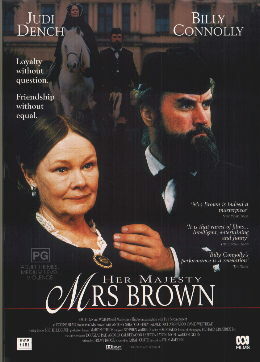 Judi Dench gets a promotion, from being M in the James Bond series to Queen of England in this period piece. She plays Queen Victoria against Billy Connolly's manservant. BBC productions are known for their attention to detail. Actresses in Upstairs, Downstairs were impressed by the silk stockings, correct to the period, but unseen, which they were given to wear. And so, when one goes to see the story of Queen Victoria and her faithful Mr Brown, one expects authenticity. And character actors. Certainly this is no vehicle for a pretty-faced soap star, but rather, an opportunity for actors of stage and screen to show their stuff. Judi Dench in particular gets an opportunity to strip off her make up and play history's most famous grieving widow. She is unafraid as the camera's eye creeps in to see a face made haggard by grief. There are no hand models in this film, no Hollywood gloss and glamour. Billy Connolly also enjoys a rare opportunity to display his ability to play more serious roles, although this is still the strong, earthy, plain man that he is so well known for. Mrs Brown is literally strewn with good British actors putting in sterling performances, however what it misses is sweeping, breathless, drama. Were the producers and writers being just a bit too careful of the British royal family's feelings? The relationship between the Queen and her servant is played with great restraint. There are no big kissing and clutching scenes, no S E X. No great passionate scenes fill the screens. And so although we see the couple enjoying one another's company, although we watch Brown make the great sacrifice on behalf of the nation, we do not see a passion so great that its denial is heart-rending. This restraint is oh-so-cliche-British. The Queen gave up an idyllic life to maintain the monarchy? Gosh, a jolly shame, eh, what? Save this one to watch on video with a spot of tea and crumpets. But do see it.